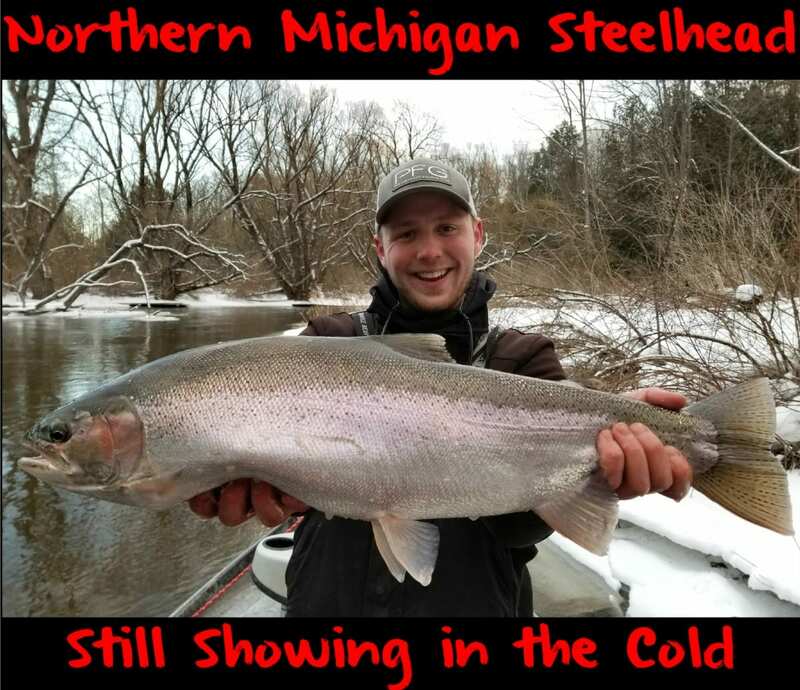 Northern Michigan offers good steelhead fishing. On the other hand, winter isn’t prime time. Still I requested guide Kyle McClelland of XXL Chrome Chasing to save three days in January to film Pautzke Outdoors in his backyard. He preferred to film in the spring when action was more consistent. Meanwhile, I wanted to fly out and test Pautzke’s new Fire Balls during the toughest time to catch fish. I flew from Southern California to Chicago to Traverse City and endured flight cancelations courtesy of American Airlines on the way in and out (all non-weather related). Mother Nature did her part too and spit snow, sleet, ice and lots of wind at us. Ironically, the cancellations and weather were the least of our worries. Having surmounted those getting the boat launched was a larger chore. The road to the river was covered in two feet of snow. McClelland tried to plow through it and we got stuck, even with a raised four-wheel drive vehicle. We made it about 100 yards and then spun and spun. After he (I stayed warm and dry in the car) dug us out we made it back to the highway. I had a better idea. Rather than giving up we drove to the McDonald’s parking lot in town and looked for a local with a plow on their truck. We found one in the drive thru. I asked Kyle to pull up next to him. He and his buddy stared us down. “You good with that thing?” I asked, pointing to the plow. “Yes,” he said, with a curious look on his face. “How much would it cost for you to open up a road for us,” I asked him. The guy and his buddy followed us down the road, plowed the previously un-passable road so we could launch the boat (it took him roughly 30 minutes), grabbed the $40 and headed back to McDonald’s. We slid the boat over a 10-foot slab of ice on the ramp and started filming. A yo-yoing barometer kept fishing challenging, which is normal in the dead of winter. On the other hand we caught fish daily without working too hard. We only fished from 12-5 most days and averaged six fish a day, but keep in mind half that time is clogged with filming how-to segments, scenic shots and rigging demonstrations, too. Our largest was about 10 pounds. (Above) Can you tell the difference? One is BorX O Fire cured eggs. The other is Chinook Fire Balls. McClelland has so much confidence in BorX O Fire cured spawn bags getting him to use the Fire Balls and change his routine wasn’t easy. However, he did show up with Coho and Chinook Fire Balls tied in sacks and in short time each day proved they worked as well as fresh eggs. He tied them in mostly pink and chartreuse netting and used four-to-five Fire Balls in each. He didn’t fish them as singles, nor did he tip them on jigs like we did when filming in Western New York last month. One of my favorite parts about filming was we didn’t have to harvest many fish to retain eggs. McClelland kept one fish in three days for dinner. Beyond that all were released – all because Fire Balls got the job done. 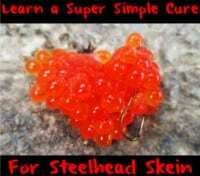 (Below) Chinook Fire Balls tied in netting. Editor’s Note: Episodes filmed on this trip will be released in mid-February. Kyle McClelland operates XXL Chrome Chasing. 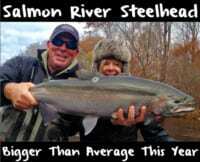 For more info on his Michigan steelhead drift boat trips please visit https://www.facebook.com/XxlChromeChasing or https://www.xxlchromechasing.com.